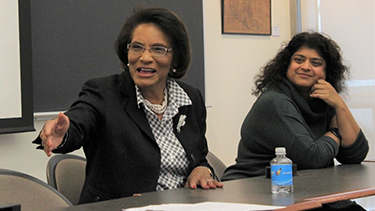 In celebration of Latina Equal Pay Day, the UNM School of Law hosted Pamelya Herndon and Sarita Nair on November 1st for its Social Justice Lunchbox Speaker Series. November 1st reflects the extra 10 months and one day that Latinas worked into 2018 to match the income earned by white men in 2017. Herndon, a leading advocate for women’s economic equality, currently serves as Co-Chair of the Rights of Women Committee for the American Bar Association and as First Vice President of the Albuquerque Chapter of the NAACP. According to Herndon, most women, when asked, believe they are receiving fair pay, but the statistics say otherwise. She said that there are laws in place to promote equal and fair pay and challenged those attending, most of whom were law students, with this: “Your responsibility . . . is to share these laws with everyone in our community.” For example, New Mexico’s Fair Pay for Women Act allows a woman to bring a suit alleging unlawful and discriminatory pay without paying a filing fee or court costs and was found to apply to the State as an employer in an appellate decision in August 2018. This event was supported by the W.K. Kellogg Foundation and UNM’s Women’s Law Caucus. The next Social Justice Lunchbox will be January 17, 2019 at noon at the UNM School of Law.